Modular-Lab Software is the renowned standard software solution coming with all Modular-Lab synthesis systems. All versions have a self-explanatory graphical user interface with the highest standards compliant to GMP, cGMP, GAMP 5 and 21 CFR part 11 regulations. An access control with four defined security levels (user, service engineer, project manager, and administrator) meets all demands for the security of the process data and the application-specific setup. The logging of all system and user operations runs fully automatically. Modular-Lab 4.3.2.0 is the renowned standard software solution coming with all Modular-Lab Standard and Modular-Lab PharmTracer systems. The synthesis process will be downloaded onto the EC, responsible for running the synthesis and allowing unhooking the laptop from the system. The use of an EC gives you the safety of finishing your synthesis run in the case of Windows® system errors. Modular-Lab SoftPLC Full is the software version counterpart of Modular-Lab 4.3.2.0 and not requiring the use of an EC, but running with Windows® only. The Modular-Lab synthesis device will be completely controlled and run by the software. Thus the laptop always has to be connected to the EC mini. The Modular-Lab SoftPLC Full version is useful for less complex synthesis setups running on Modular-Lab PharmTracer, e.g. 68Ga labeled peptides, [18F]NaF or other compounds. The editable Modular-Lab Software versions require the use of a dongle license in order to access and run the program. The software automatically updates projects when loading old ones. 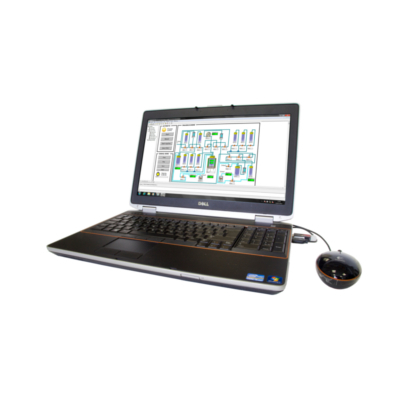 Programming is very easy and works via a self-explanatory graphical user interface. The power circuit function helps to estimate the capacity of modules linked to the bus cable. Programming a process simple drag and drop of graphical symbols Macro-Wizard for programming of each process step including its parameters process steps are graphically visualized in a flowchart. An analytic tool for your quality control (QC) equipment can additionally be activated for both versions (see RaPET Chromatography Software for more information). The Modular-Lab eazy software is based on a non-editable basic version of Modular-Lab 4.3.2.0 and Modular-Lab SoftPLC Full not requiring the use of an Electrical Cabinet. It can be installed on already existing lab computers since it is license free. The Modular-Lab eazy software has been designed for one specific device and synthesis process, e.g. 68Ga labeled peptides. Programs cannot be changed nor saved. The version is only used with Modular-Lab eazy. Optionally, an analytic tool with quality control functions for QC equipment can be activated. All three versions have a self-explanatory graphical user interface with the highest standards compliant to GMP, cGMP, GAMP 5 and 21 CFR part 11 regulations. An access control with four defined security levels (user, service engineer, project manager, and administrator) meets all demands for the security of the process data and the application-specific setup. The logging of all system and user operations runs fully automatically. Apart from the basic software and programming training during the installation of your Modular-Lab, Eckert & Ziegler upon request offers additional synthesis and software trainings to refresh your knowledge or incorporate new colleagues. All trainings can be tailored to your demands.